Recently I took part in a discussion on Press TV's Africa Today programme with Association of African Owned Enterprises chair Washington Kapapiro and academic George Shire about the EU's lifting of sanctions on President Robert Mugabe's government whilst retaining restrictive measures on Mugabe himself and his wife Grace. As argued by many others before, including Oxford academic Blessing-Miles Tendi, the EU's singling out of Mugabe brought home the hypocrisy that has dogged its foreign policy on Zimbabwe at a time when the bloc is about to engage the ICC-indicted Kenyan President Uhuru Kenyatta as part of the EU-Africa Summit. Indeed, the gesture, touted as a reward for the passing of a new constitution and decline in political violence in the 2013 elections, is widely seen as a climb-down in order to allow members of the EU to re-enter Zimbabwe's economy, where the Chinese dragon currently enjoys free rein. Belgium has been instrumental in pushing for the EU's climb down in order to clear the way for Zimbabwe's alluvial diamonds to markets in Antwerp. 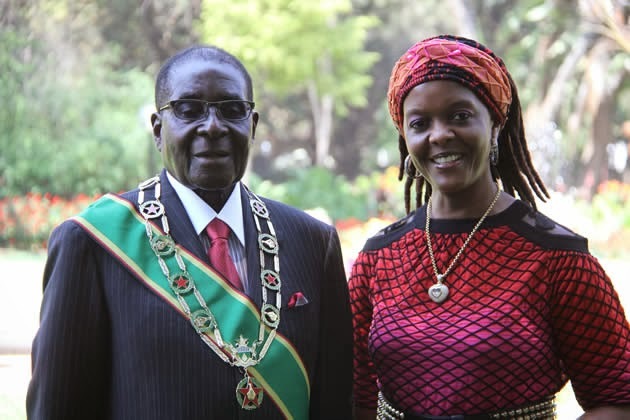 The ridiculous retention of Mugabe and his wife on the sanctions list was a compromise to Britain, whose visceral dislike of Mugabe was so hammered by politicians and the media into the heart of public opinion that to now proclaim Mugabe as free to visit Britain and elsewhere in Europe as he likes would produce a public backlash. And so the British are, in this respect, prisoners of their successful demonisation of Robert Mugabe. It is not that the veteran nationalist has no checkered human rights record to answer to; rather, it is the inconsistency in the implementation of what the late former UK foreign secretary Robin Cook claimed to be an 'ethical foreign policy' that has left the UK's Zimbabwe policy in an untenable position. In this sense, the retention of sanctions on Mugabe and his wife whilst letting off his entire government and security chiefs comes across as no more than a fig leaf for the UK.